Those who don’t know of the greatness of the past tend to think that sexual deviancy is a fairly new battle with warriors gallantly taking arms in the throngs of this new millennium. Well, think again. As King Solomon proclaimed, “There is nothing new under the sun.” One need only look into the Torah to see all of knowledge – past, present and future, as well as an all encompassing compass toward decency and decorum. The issue of sexual deviancy is stated in the five books of Moses and expanded upon by Rashi, and countless masters of the Talmud. But let’s take a look at one of the most noted of Talmudic masters – the Rambam (Maimonides). “With regard to the killing of a Jewish person to heal another person or to save a person from one who is compelling him, it is logical that one person’s life should not be sacrificed for another. 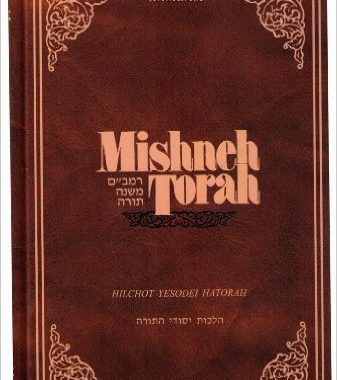 [The Torah has] established an equation between forbidden sexual relations and murder, as [Deuteronomy 22:26] states: “This matter is just like a case where a person rises up against his colleague and slays him.”” Lest someone conjure thoughts of misplaced excuses and understood desires, the Rambam makes it perfectly clear that destructive and abusive relationships are unacceptable to the extent of a person losing his life is acceptable. The Rambam knew very well the weaknesses of the weak, the sick and the perverted. He understood that someone just “dying” to molest and abuse another should do just that….die.